When I spotted these paper wasps alongside the trail, I only halfheartedly took a few shots. Mostly, I just didn’t think I’d be able to get an attractive photo out of it. So when I was reviewing my shots, I just about deleted all of them, including this one. At the last second though, I noticed something unusual in the photo. I call these sorts of discoveries where I notice something in the photo that I didn’t realize was there when I took it “easter eggs.” It happens often enough that I just decided to add a new category for that here on my blog. Back to the photo though. What caught my eye are the little black things in a few of the cells near the top center of the nest. Zooming in, you see this. 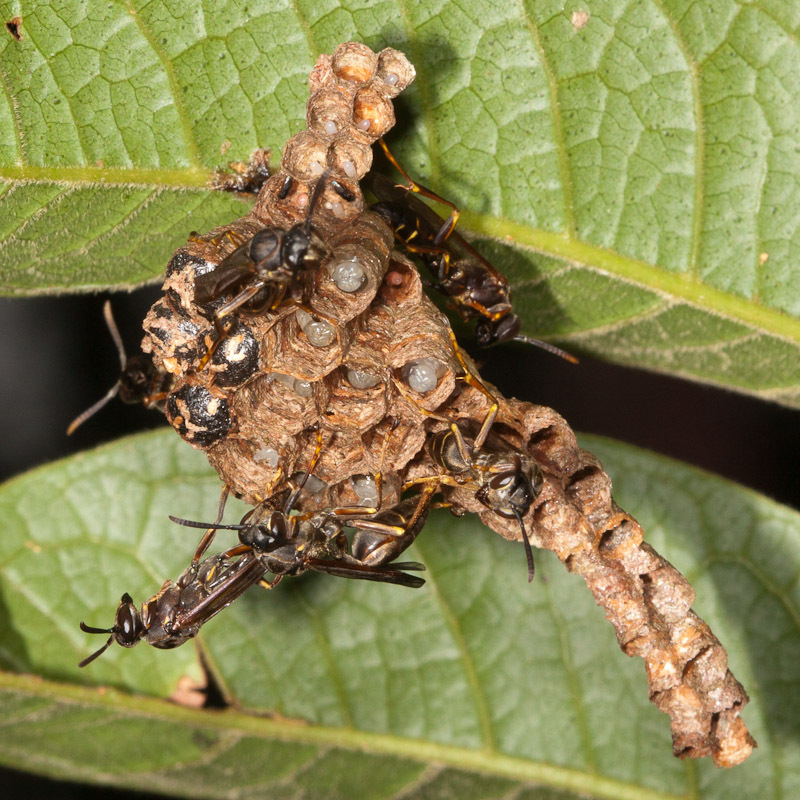 I assume those are some sort of parasitoid flies or wasps. You can see a few paper wasp eggs at the top. I’m not quite sure what to make of the contents of the cells with the adult parasites. There’s an extra little white blob with the one on the right. Could that be the parasitoid larva? If so, why would there be an adult in the cell with it? Seems too big to be a parasitoid egg. And what are the pinkish blobs with the adult on the left and in the lower right? 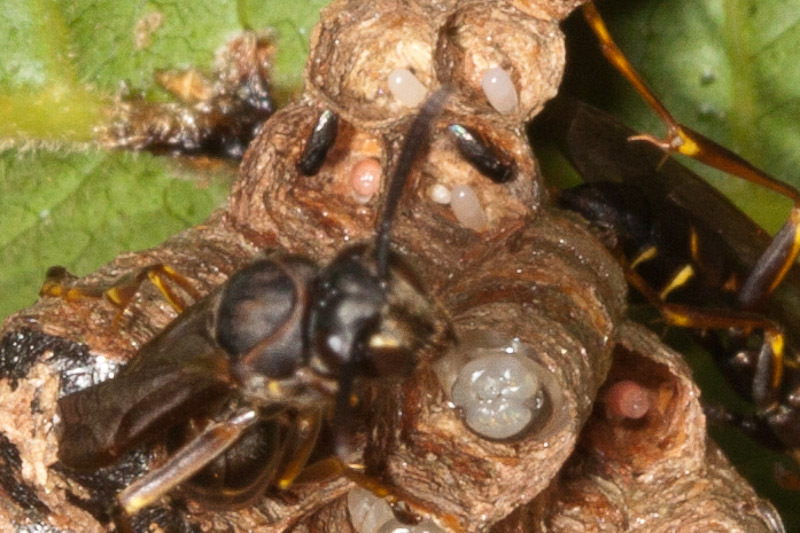 Are those the parasitoid larvae or is that what the paper wasp larva look like at that stage? As usual, I have many more questions than answers. I’d love for someone to help fill me in if they know what’s going on here. This has definitely fueled my curiosity though. I’m likely to brave some stings and try to get some closer and better focused shots of nest cell contents on future encounters. This entry was posted in Easter Eggs, Featured Photos. Bookmark the permalink.